Truth is arduous if not impossible to come by in the Kali Yuga. The written word is a ‘symptom’ of the Kali Yuga because writing does little to convey the true deepest essence of realities beyond apparent density. Sacred texts can be altered by what one scholar describes as ‘additions, interpolations, abridgement, omissions, etc.’ In other cycles of time, for example the Krita-Satya Yuga, the Golden Era, we communicate mind-to-mind and thus lies are not possible. But here in the Kali, lies dominate our current temporal illusory hologram, liars rule our world, and sadly people have come the ‘prefer false ideas’, which is yet another symptom of our current Age of Confusion. I think of Krishna as God Realized in a human form – in other words, he represents the highest ideal of humanity in the sense that he was totally One with God. In the west this state of being is often spoken of as Christ Consciousness. When a person in human form realizes the God-within, they become enlightened and in western terminology gain Christ Consciousness. There are many men and women throughout time who have achieved enlightenment and realized the God-within them, but not all of them have taken on such overwhelmingly immense spiritual tasks, as did Krishna and Jesus. Krishna left this earth at the end of the last Yuga, the Dvapara, after the Great War described in the Mahabharata. The Bhagavad Gita, contained within the Mahabharata, is Krishna’s discourse to Arjuna the greatest warrior of that time. Krishna knows that the Kali Yuga is coming upon mankind. He realizes that human consciousness will soon be ‘cooked by time’ and that ignorance and delusion will permeate the temporal illusory hologram and so he explains the efficacy of Devotion to achieve Union, Bhakti (devotion) Yoga (union), for the Kali Yuga. Freed from passion, fear, and anger, absorbed [immersed] in Me [the God-within], taking refuge in Me, and purified by the fire of Knowledge [the austerities of insight], many have become one with My Being [the eternal Self-Atman]. Perhaps it is true, as some scholars say, that some of the missing years in the life of Jesus were spent in India and Kashmir. If so many of the texts on his life and teachings we now have available to us had not been altered or destroyed by tyrants over the centuries, there might be teachings concerning God Realization through Devotion - known in Hinduism as BHAKTI YOGA. Fortunately the Sanskrit texts have been safely preserved to give us insight into the power of devotion and what Krishna calls the religion for the Kali Yuga. God dwells in the Heart of each and every man, woman, and child. Thus it is through the frequencies of love and devotion, of subtle inner feelings and emotions – not dependent on external polarities - that we may reach the eternal Home within us. Now for those of you in the west especially, I am not suggesting here that you shave your heads and run to the nearest airport to beg for money. Certainly we all know that abuse of sacred teachings runs rampant in this world. So without relying too much on the texts themselves here in Part One, I am going to tell you what Bhakti Yoga has come to mean to me personally and how it works in my life. You can read the texts for yourself and create your own connection to the God within you. For example when I first heard about Bhakti Yoga in the 1970’s and read Narada’s Bhakti Sutras, I decided that every time I heard a ‘love’ song, I would think of it as God singing to me or me singing to God. I realize this sounds somewhat naïve, but it works. It keeps me in an inner consciousness of remembering. Yes I know that there is sacred music and profane music, but it is also true that Isness permeates the entire universe. See God in every Eye. I admit that these days it is harder to find a sweet melody that conveys the subtle feelings of unconditional love and that is why I love Hindi film music, especially the sublime songs of A.R. Rahman. Of course, if certain music lowers your consciousness - turn it off! Remember how you felt when you ‘fell in love’? If you can recreate those feelings in your imagination and direct them to the God-within you, you will be well on your way to understanding Bhakti Yoga. These feelings of love are the most powerful energies in our world. Love is the underlying frequency of everything. Love created this universe. Love is the source and inspiration of all great works of art, music, and literature. 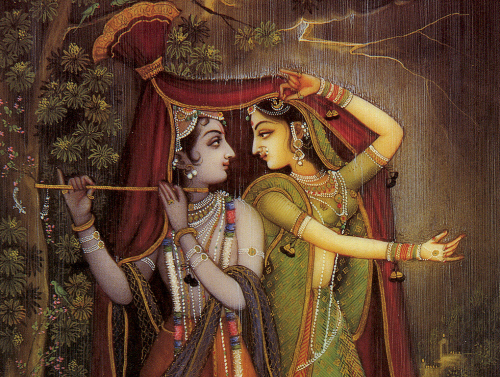 When you are ‘in love’ you think of nothing else but your beloved. Thus your consciousness is totally focused with a fierce intensity perhaps quite impossible in any other experience. When you are ‘in love’ both reason and practical caution are suspended. You foolishly live in a world of your own, a world of bliss, delight, and sweet imaginings – your consciousness is completely altered. You shine, you literally glow with love, and others wonder what’s up with you. Your feelings are contagious. ‘All the world loves a lover’ because we all long to be in that state – forever. This is what Bhakti Yoga is all about. The aspirant uses the feelings of love, adoration, and devotion to achieve higher states of consciousness and ONENESS with the Beloved, meaning the God-within you. One of the greatest wonders and mysteries of this life is that God has left us all with a secret longing in our hearts that allows us to reconnect with our Source and Home. Again take a moment and recreate for yourself, those sublime feelings you experienced when you lost yourself to another and happily fell madly, crazed, head over heals in love. You idealized a person to be perfect, their eyes, their hair, that smile, even and especially their fragrance. When you really love someone, they smell so good to you. Unaware of time, you could spend days just looking into their eyes or touching their skin. Who can recall the exact words lovers whisper to one another? Sweet nothings evaporate in the intoxicating fervor of the moment. Everything in your life becomes focused on feeding the flames of your tender feelings, your ardent passions, your unbidden devotion to your ideal, your Beloved. Then time passes. It may take only a moment, maybe a week or a year – and suddenly that very same person is perceived as less than ideal. For example, the moment you saw him or her snuggle up to your best friend in a slightly seductive manner, you became disillusioned. As if a large rock has fallen on your head and into your heart, suddenly love hurts - and you see the warts, the imperfections. The same person who a moment before could do no wrong, now snores and farts, likes all the wrong things, and has absurdly stupid opinions! Bewildered, you ask yourself – What did I ever see in him or her? And the answer is: You saw your Self. You idealized a part of your Self, the God-within you and externally projected these ideals onto that person, who was clueless about the complexities of your inner and probably unexpressed expectations. I would suggest that at this point in the Kali Yuga, almost no one sees anything outside of our own hologram. We only see through the filter of our own limited perceptions, perceptions imprisoned and totally ruled by the unseen forces of GUNAMAYA. Unless another person reflects the frequencies of your own hologram, you have no idea what they are about. You never even ‘see’ them, not as they are – only as you imagine them to be. When you ‘fall in love’ what you are really doing is projecting a portion of your unrealized Self onto an unsuspecting other. Therefore you can utilize this most powerful reflex mechanism to focus on the God-within you. Simply think of everything you idealize and love in your perfected paradigm of the Beloved and use those thoughts to remain immersed in the God-within. A continuous experience of an intensely focused immersion in the Divine Love of God will purify your mind more effectively that reading 100s of spiritual books or any ritual. People who seek spiritual powers first do not understand that these abilities are the natural consequence and result of our Union with the God-within us. Paranormal powers are not the purpose of jivan mukti. In the Kali Yuga, being immersed in God’s Love is the safest, easiest, most assured and blissful way Home. The spiritual practice of Union achieved in Devotion works!